Last week Oli was given a pair of tickets to Saturday's Canucks game. Though most people would probably be pretty thrilled to get free tickets to an NHL game, particularly given how bloody expensive they are, I wasn't. I initially didn't want to go, as I'd be rushing home from a full day of classes to do it, but I soon changed my mind & decided free tickets would be a good opportunity to see what a live NHL game was like. Though I am definitely not a fan, I'm not a total hockey virgin--I've been to several Vancouver Giants games over the years. (For those not in the know, the Giants are a junior feeder team for the NHL) I enjoyed myself there & it gave me an idea of what to expect at the Canucks game. The scale of everything was larger with the Canucks--the stadium held more fans, the beer & food cost more, the entrance of the players was even more over-the-top with glowing red lights, fake smoke & flashing lights everywhere. The ticket cost is probably what makes the biggest difference to the atmosphere of the games. For a front row seat to see the Giants play at the Pacific Coliseum, it's $22 (or was last time I went--don't quote me on that). For a Canucks ticket like we had, about half way up the stadium in the 19th row, you'd pay $330. The Canucks crowd was a lot more well-heeled, a lot fewer children & not that many big groups of people that I could identify. The Giants games have a real community feel & the stands are generally full of little kids & families. Maybe the serious hockey fan could tell the difference between the game play & the skill of the players from the Giants to the Canucks, but I didn't really see it. I'm glad I had the experience, but I wouldn't pay for tickets to go see an NHL game. What about you? Are you a die-hard NHL fan? What do you like about the game? Or are you like me & couldn't really care less about pro sports? 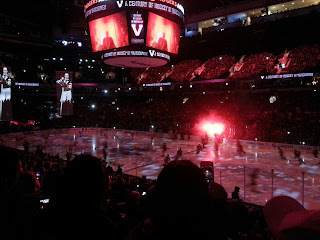 At the game, I learned: that if you sit in the not-cheap seats and some aging boomer oaf spills his beer on you when jumping up for the first goal, so will very likely get a branded Vancouver Millonaires hoodie bought for you, courtesy of Mr. Clumsy. I've had plenty of drinks spilled on me over the years and no one bought me nuthin'!